Give yourself a "helping hand" with your own, affordable AT-H-001 Helping Hands. With a heavy cast iron platform base, this benchtop essential fixture features six movable ball joints for any angle needed providing flexibility and superb utility when an extra hand is needed. 4X Magnifying Glass. 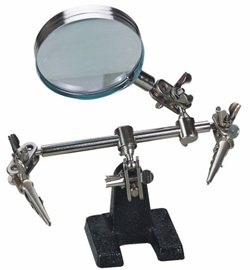 The AT-H-001 features a 4x magnifying glass for inspecting your work and tiny components or parts. Of course, the AT-H-001 Helping Hands is terrific for soldering wiring, helping with cutting and stripping wires and not just for soldering or de-soldering only. We also have found that those doing jewelry work really like the AT-H-001. And since the price is so swell, why not pick up one for a friend, fellow co-worker or colleague today? What a great way to let them know you appreciate their helping hands by giving them back a helping hand for their bench. In stock now at our Los Angeles County factory and warehouse. ©1996 - 2011, 2012, 2013, 2014, 2015, 2016 by Zephyrtronics®. All rights reserved. The information, text, images, photographs, charts, graphs you receive online from Zephyrtronics® are protected by the copyright laws of the United States. The copyright laws prohibit any copying, redistributing, retransmitting, or repurposing of any copyright-protected material. Zephyrtronics is the registered trademark property of JTI, Inc. "The Science of Zephyrtronics" and "Simplicity Through Innovation" and "Zephlux" and "ZeroLead" and "Zero Balling" and "Zero Residue" and "Post Cooling" and "Post Cooler" and "AirBath" and "SolderGlide" and "SolderMill" and "Just So Superior" are the protected trademark property of JTI, Inc. "Zephyrtronics" and "Low Melt" and "Air Fountain" and "Fountainhead" are the registered trademark properties of JTI Inc. *The above names are the registered property of their respective owners.